King expands, with diagrams, on how free energy and anti-gravity are possible. The theories of zero point energy maintain there are tremendous fluctuations of electrical field energy embedded within the fabric of space. King explains the following topics: Tapping the Zero-Point Energy as an Energy Source; Fundamentals of a Zero-Point Energy Technology; Vacuum Energy Vortices; The Super Tube; Charge Clusters: The Basis of Zero-Point Energy Inventions; Vortex Filaments, Torsion Fields and the Zero-Point Energy; Transforming the Planet with a Zero-Point Energy Experiment; Dual Vortex Forms: The Key to a Large Zero-Point Energy Coherence. Packed with diagrams, patents and photos. With power shortages now a daily reality in many parts of the world, this book offers a fresh approach very rarely mentioned in the mainstream media. •Tapping the Zero-Point Energy as an Energy Source •Fundamentals of a Zero-Point Energy Technology •Vacuum Energy Vortices •The Super Tube •Charge Clusters: The Basis of Zero-Point Energy Inventions •Vortex Filaments, Torsion Fields and the Zero-Point Energy •Transforming the Planet with a Zero-Point Energy Experiment •Dual Vortex Forms: The Key to a Large Zero-Point Energy Coherence •Packed with diagrams, patents, and photos, with power shortages now a daily reality in many parts of the world, this book offers a fresh approach very rarely ever mentioned in the mainstream media. 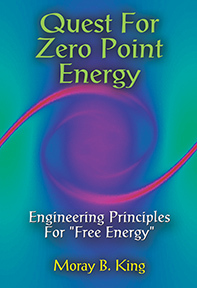 QUEST FOR ZERO-POINT ENERGY: Engineering Principles for “Free Energy” by Moray B. King. 224 pages. 6x9 Paperback, Illustrated. Bibliography.